Here is a sneak-preview of what will be released in Sage CRM 7.2. The release of Sage CRM 7.2 delivers a host of exciting new features and enhancements that help you leverage the latest trends in mobility, Social CRM and business collaboration. Two new mobile apps will be available for download. The iPhone app will be available from iTunes (yes this will be an actual app) and the Windows 8 app from the Windows Store once Sage CRM 7.2 is released. Sales Lite is an iPhone app that is specifically designed for sales users on the road who need upto-date information on their phone (even when out of coverage). 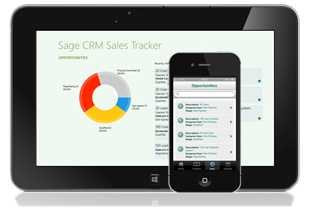 Sales Tracker gives mobile sales people view-access to Sage CRM sales and contact data on the road using Windows 8 tablet devices. Sage CRM 7.2 will also include iOS support for tablet. The new device/theme for optimizing Sage CRM for tablet is now supported as an integral part of Sage CRM On-Premise, as is access to most key Sage CRM features using the regular “Desktop” version of Sage CRM from your iPad.